Sarah Bakewell, At the Existentialist Café. This book is not of the sort that I often include on this list — which tends to be focused on matters of education, child development, and digital media — but I read it over Spring break and hugely enjoyed it. Ms. Bakewell takes the reader on a jaunt through the lives of leading existentialists, beginning early in the 20th century and extending through the end of the life of Simone de Beauvoir, one of the main characters. There’s a fair amount of resonance with current cultural and political debates in the themes she takes up. Anyone who read the existentialists as a young person and was intrigued will enjoy coming back to them via this book. The story is a blend of the lives of the philosophers and the way in which the author (Bakewell) experienced their works. It’s a lot of fun. Jeff Hobbs, The Short and Tragic Life of Robert Peace. Such a powerful, sad story. A précis can be found in this New York Times review. Those of us who work in academic settings that seek to bring together talented young people from everywhere (“youth from every quarter,” in our charter), the issues that this narrative raises are essential to consider. Actually, anyone who lives in America should read this book and consider the hard issues that this account of Mr. Peace’s life and death pose for us as a society. Jessica Lahey, The Gift of Failure. Ms. Lahey takes aim at how many of us parent and educate today — and tells us that we need to let our students fail more often. This book is in line with many of the faculty meeting conversations we have at Andover, as we consider how we can support all our students in both their successes and their inevitable adolescent failures. As young people perceive they need to be “perfect” to get into their “dream schools” for college, the job of enabling them to fail safely and recover well is increasingly important. Though not entirely new as a message, readers will enjoy Lahey’s perspective as a middle-school teacher, someone on the front lines of this ongoing debate about how best to raise a generation. Chang-Rae Lee, Native Speaker. I seek to include at least one work of fiction on each Head of School bookshelf list. This novel is a few decades old (1995); it still resonates in terms of the cultural issues it raises, and it holds up well as an enduring work of fiction worthy of study in its own right. Our English teachers at Andover often teach it. The characters are beautifully wrought. And the use of language (itself a theme in the book) is lovely. Liz Murray, Breaking Night. This book is not new, either (2006) — and many will have seen the made-for-TV special about Ms. Murray’s life. The story is both challenging and uplifting. For those of us in boarding schools that have students from every socio-economic bracket, some of the lessons in this book are hugely important. There are many powerful messages in this first-person account of an extraordinary life, written by a young person early in her career. 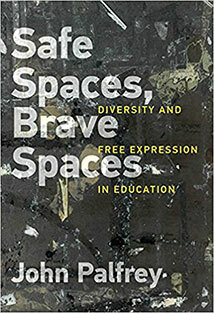 (Murray’s book is paired with the book about Robert Peace, above, in terms of the challenges faced by those who bridge cultural gaps in coming to elite educational institutions.) With a h/t to my colleague Heidi Jamieson at Andover for passing along a copy of the book last term. As usual, I’m also putting out additional copies of books by recent speakers on campus. Two of these: danah boyd’s It’s Complicated: The Social Lives of Networked Teens (on a previous HOS bookshelf list) and Moustafa Bayoumi, This Muslim American Life: Dispatches from the War on Terror, both well worth the read. Links to a few recent lists: here (mostly on tech and sexuality), here (innovation), here (teaching, talent, and testing), here (fiction), and here (a mix, as this Spring’s is, too).